Apple’s slew of hardware updates on Tuesday didn’t stop with just desktops. The company also threw in updates for the AirPort Extreme base station and the Time Capsule backup device. Both peripherals now feature simultaneous dual-band capability, letting you run 2.4GHz- and 5GHz-band networks at the same time. 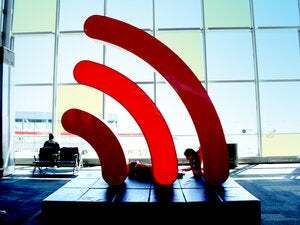 Since previous AirPort and Time Machine models included only a single antenna, they could operate in only one band or the other, so owners with both 802.11g and 802.11n devices were forced to use the slower 2.4GHz band (which is g- and n-compatible) rather than the n-only, but faster, 5GHz band. If you wanted to run a true dual-band network, you had to purchase separate hardware for each band. With the new dual-antenna architecture of the AirPort Extreme and Time Capsule, 802.11n-capable devices—any of the Intel Core 2 Duo Macs, for example—and ones that operate on 802.11g can now take advantage of the band that would best serve them. This means you can get the fastest possible speed from your 802.11n-equipped devices while still providing wireless access to your older, slower 802.11g hardware. The updated peripherals also add Guest Networking, a feature that allows you to create a separate network for visitors (which you can choose to protect with a separate password) that would only allow them access to the Internet. That lets you keep all your shared printers, drives, and other devices, as well as shared libraries out of the reach of guests. Time Capsule boasts an enhancement of its own—the ability for MobileMe subscribers with OS X Leopard to access the contents of the device’s hard drive over the Internet. Once you configure Time Capsule to work with your MobileMe account, it will show up in the Finder sidebar on any other Mac you may be using (provided you are logged into MobileMe on both Macs, of course). You can read from and write to that drive just as you would any local Network Attached Storage device. Prices remain unchanged on the two products—the AirPort Extreme base station sells for $179, while Time Capsule costs $299 and $499 for its 500GB and 1TB configurations. Updated at 8:12 a.m. PT to include information on Time Capsule’s MobileMe feature. Updated 3:04 p.m. to clarify some statements about how dual-band works.